When Dr. Carlos Cadena Gaitán ’05 was selected from more than 100 nominees across six continents to be the 2015 International ‘Future Sustainability Leader,’ he was caught off guard. “It was a huge surprise. The Colombian media quickly caught up with the news, and it was widely published all over the nation,” he said. A native of Medellín, Colombia, Cadena Gaitán came to Reinhardt in 2002 on a one-year Georgia Rotary Student Scholarship. An exemplary undergraduate student leader, he completed a prestigious internship with the New York City Government in 2004, played tennis, met his future bride, Reinhardt coed Carolina Daza of Barranquilla, Colombia, and earned a B.S. in Business Administration from Reinhardt in 2005. Cadena Gaitán continued his education with a Master of Public Administration from Georgia State University and a doctorate from UNU-MERIT, a joint research institute of the University of Maastricht and the United Nations University, in The Netherlands. During his doctoral studies, he helped form La Ciudad Verde, a Colombian activist think tank that promotes sustainable cities through citizen participation and creativity. The organization uses social media and art to share academic knowledge. 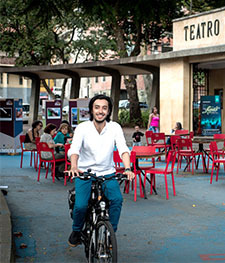 He also coordinates the World Bicycle Forum, which brings together citizens, advocates, researchers, administrators, policy makers and artists to promote cycling as a serious form of urban transport. Cadena Gaitán hopes to find key allies that will help replicate their messages and strategies in other countries. He also plans to continue travelling the world, teaching and researching.